Bordered by Eritrea in the north, Ethiopia in the west and south, and Somalia in the southeast, Djibouti is a country on the horn of Africa. 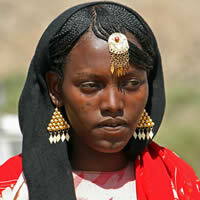 Arab, Djiboutian people are those from Djibouti who are ethnically Arab. Djibouti is home to several people groups including the Somali and Afar, both making up the two largest people groups. The remaining 5% are Arab, Ethiopian, and European descent (French and Italian). Arabic and French constitute the country's two official languages. Arabic is of social, cultural and religious importance. In formal settings, it consists of Modern Standard Arabic. Colloquially, local residents often speak the Ta'izzi-Adeni Arabic dialect, also known as Djibouti Arabic. French was inherited from the colonial period and is the primary language of instruction. About 94% of people in Djibouti adhere to Islam. The Arab, Djibouti in North America are not an exception. While they convert to or marry someone from another faith, they are likely to encounter negative reactions from their family and clan at large. Ask God to reveal the truth in Jesus Christ through dreams. Pray for the Arab, Djiboutian people to learn that they may know both the ultimate and intimate God through Jesus Christ.